As entrepreneurs some of the toughest challenges that we have to deal with is being overwhelmed, the never-ending to-do list and information overload. 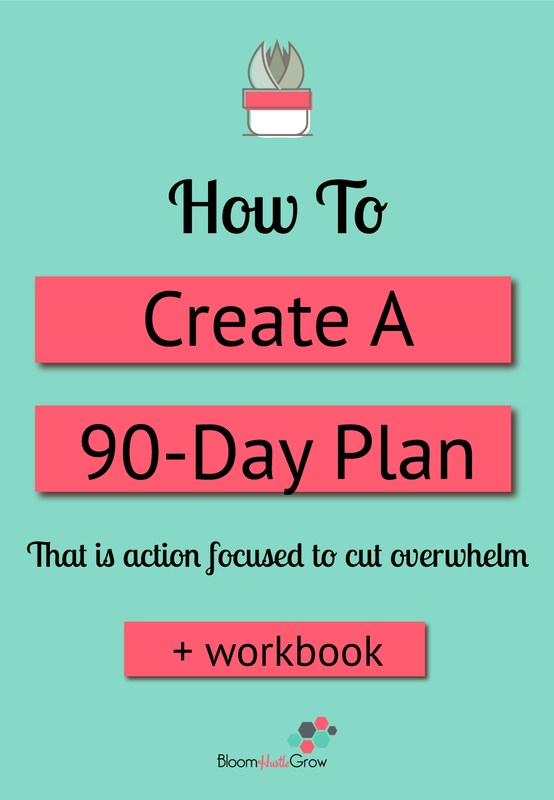 This 90 day plan is not about everything you think you need or want to do for your business in next 90 days. This plan is about gaining focus and consistency in your efforts to grow your business. Grab the workbook to craft your focused plan! Let’s start with why you are in business, it should be to make money and serve a customer. As a business your goal is to be profitable and you do that by serving a customer. This should be the driver to your goal setting. So, we start our 90 day plan by asking ourselves how much money we realistically expect to make and to do that how many clients must we serve. I personally like to have one higher money goal for the end of the 90 days, just as a larger goal to reach for. Here is an example, these numbers are low and made-up just to keep it easy. Your numbers should be based on your own sales and customer levels. If you are just starting out than do go lower, if you are just building your business and contacts you can’t realistically expect to get 100 clients the first month or 20,000 in revenues. You want these goals to be realistic and attainable, but also to push yourself. Now ask yourself how am I going to reach these customers to make these sales. What needs to be developed to serve and reach my customers? What communication channels am I going to use to make connections with my customers? What products am I trying to get them to buy? What needs to be developed? What support structures do I need? Where is my focus for point of contact with this customer? After brainstorming choose a project or two to focus on for the next 3 months that will build a stronger connection with your potential customer. How can you make a stronger connection to them and show what you have to offer? An example of a project could be to grow your email list, especially if you are just starting out. If you are more established your project focus might be, to figure out another way to serve your audience. Is that an e-course or some evergreen product? How can you expand what you offer to better serve your customers, but also make you money (directly or indirectly). Other measurable projects might be Facebook Group members, webinar participates, podcast followers….etc. Once you have your focus, figure out what supporting tasks you need to do your focused contact project. For the email list building example, supporting tasks might include blog posts, content upgrades, and newsletters. This is about not throwing yourself in a million directions trying to reach your target audience. This project should be about focusing on reaching your audience on a more in-depth level or serving an un-met need in your audience. Now think broader, how am I going to leverage my product, website, webinar, blog post, etc. How am I going to get the word out about who I am and what my business is to attract those potential customers to make more of a connection with me? What channels do I want to focus on to grow my followers? Pick only two channels maximum to focus on. Maintain your other channels, do not leave those vacant if you have them, but they are not going to be your main focus for growth. What is your social media strategy going to be to grow the above channels? What is your schedule going to be? How much time each day are you going to spend on engagement? How are you going to focus on the above channels to see growth? Start researching or pick up a course on maximizing that social media channel. Start following those steps. Think about the above as a triangle. The top are your customers those who have given you money, the middle are those who might give you money, they are more actively connected to you. They watch your webinar, they read your blog, they consume what you are offering. You have more of a connection with them and are delivering more content to them. The bottom is those you’re trying to attract; the larger audience so they know about you, they follow you on social media and hopefully they will want to get to know more about you or your product. 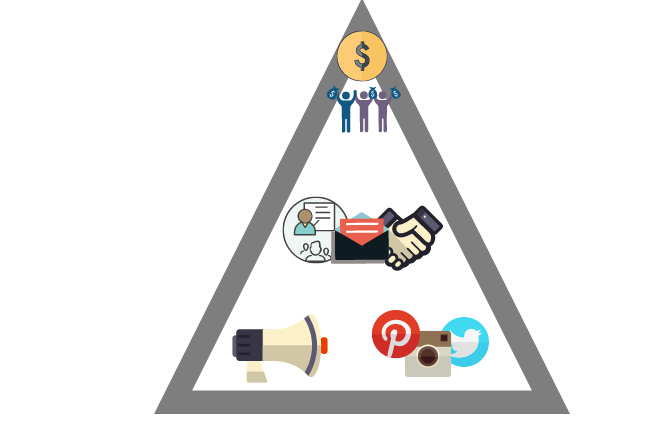 It’s a similar concept to a sales funnel, which is just the triangle turned upside down 🙂 But I want you to think of it in terms of what you are building. How do you attract people to the first floor to be a follower, how do you attract people to the second floor and know you better, how do you attract people to become a customer. Each layer is supporting the layer above it. Ask yourself what systems do I need in place to do the above. It might be a way to process payment, to schedule posts, or to schedule clients. Get these taken care of. You don’t need to have it all figured out, you just need to figure out what you need right now. Ask yourself what skills you might need to learn? Look for courses or even articles based on the above focus. If I want to grow Pinterest then I’m going to start looking for articles based around that, maybe pick up someone’s course on it. Growing your email list, then take a class on growing your email list. Don’t get distracted by other courses, there is always new things to learn, focus on those key items you want to do right now. The other courses will be there later. Now get down to business. Plan out what and how you are going to do it. Be consistent. Consistency with your strategy is most important. That is why I say, only choose two projects and two channels at most to focus on. You need to be showing up and promoting, delivering, and engaging every day. You can’t really give your all to 100 different directions, you can’t build followers, sell passive income courses, sell coaching courses, sell a book, and have 1-1 clients all as the same focus when you are starting. These things build from one to the other. Starting your own business is an experiment, things change. You try different techniques, and you see what works, but you need to give these techniques a chance to see if they work or not, one month is not usually enough time to figure it out. Jumping from strategy to strategy is a good way to burn out and leave your customers confused. Change is fine in business, just make sure you are testing on a reasonable timeline. Make sure your focus is connected and builds on what you are trying to achieve now, not 2 years from now. Don’t start pursuing a new avenue just because some day you want to go that route. Focus on what your business needs right now, not what the newest thing is or what someone else is saying you HAVE to have. Guess what, if the new thing is worthwhile it will be there in 3 months and you focus on it then. It’s so easy to want to go after the new idea or next shiny marketing tool, but that’s most likely going to set you back. The less focus you have the more time it’s going to take to see results. Less focus = Longer to Grow Your Business. Gain focus with this 90 day plan. Stick to your plan. Accountability can be a hard one. It’s hard to stick to a plan when you don’t see immediate results, you get scared, you get frustrated…and this is when it is easy to fall into finding a distraction. Do the work and see the results. This plan should help keep you from jumping from strategy to strategy. But if you do need extra help I offer a variety of packages designed to help you get a plan and stay on track.